This is probably a very naive question, but here it goes: Was there an economical or political reason for the invasion of Tibet by China in 1950? It does not seem to me that Tibet is a particularly wealthy place. Is there some resources there that I did not hear about? Did the Chinese government need to distract its people for some reason? Or is it just that the bigger you are, the better for you and Tibet was simply colonised? It's true that China has "claimed" Tibet. But why would China claim such a barren land? Does it have some sort of strategic value, and if so, what would it be? 1. Tibet has control of most the water in China; the Huang He and the Chang Jiang originate there. 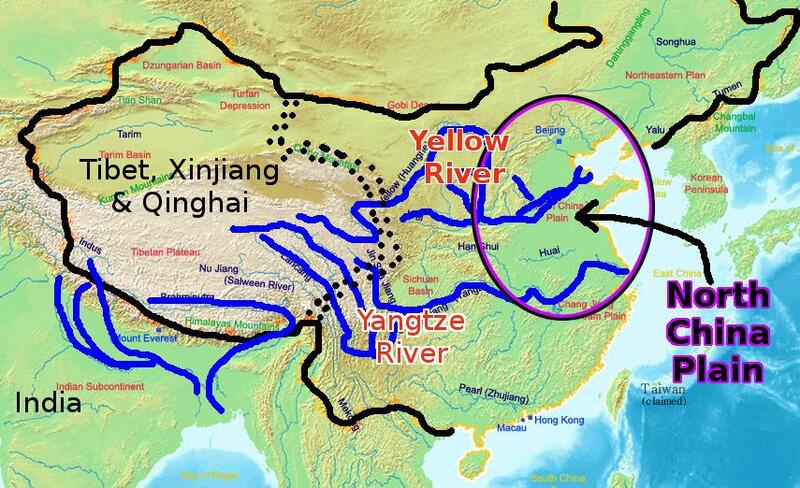 If you exercise control these two rivers, power can be projected over heavily populated East China. 2. The Himalayas make an excellent frontier. After a hundred years of misery handed to China by colonial powers, securing the border territories was important. In a few words, Mao didn't want US military bases in Tibet. China has most of its people in the East, while Tibet on the other hand, has very few. It is well known that China today has over a billion people. Back in 1950, China had about 550 million, also mostly in the East. That's a lot of people to feed; and like most parts of the world, China feeds its people through agriculture. Most of the agriculture is in the East, and as I will cover in a moment, the North China Plain relies heavily on irrigation from the Huang He. 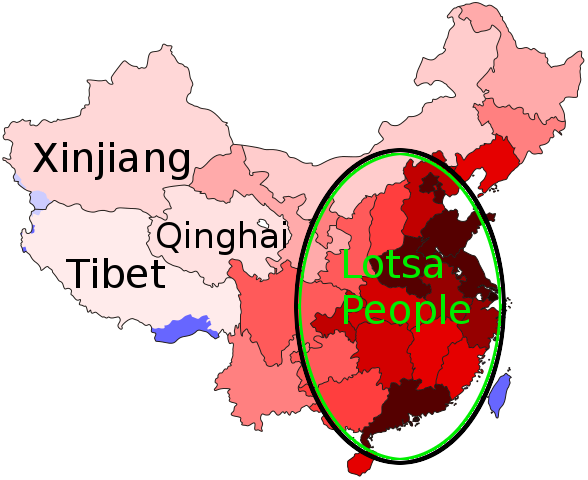 The 3 provinces to the West, Tibet, Qinghai, and Xinjian are important to China for several reasons. I would argue that the most important is that they contain the headwaters to the Huang He (Yellow River) and the Chang Jiang (Yangtze River). The point here is that once the PLA and the CCP had just gained control of the populated regions to the east, they took control of the sparsely populated regions to the west, all around 1950. See how the rivers come from Tibet? The North China Plain, the heartland of the ancient Chinese culture, is sorta like a gigantic Kansas. They grow a lot of food there, enough to feed 250 million. However, sometimes the rain doesn't come correctly in the summertime for years. Without irrigation, this means mass starvation, and political instability. And Mao and the CCP wanted to stay in power, so good irrigation in the North China Plain was essential. As Chang Kai-shek's GMD and their American & British backers were the enemies of Mao and the CCP, British control of China's water and hence irrigation resources would be an absolute disaster. This explains the vital importance of securing Tibet and Qinghai. For those who doubt the importance of irrigation to the peasants in China, specifically those who marched in the People's Liberation Army, consider how Chang Kai-shek killed 10 million in the North China plain to delay the Japanese military advance by a few months[Note 2]. Many of the fatalities were related to starvation, caused by irregular irrigation. As the long term survival of the CCP regime was less than certain in 1950, expanding control of water resources was a priority. Mass starvation in the North China Plain had to be avoided. Counterpoint: What about Tibet's independence? Why does did China need to control Tibet? Couldn't they have just trusted Tibet with their water? Specifically, it wasn't like Tibet in 1950 was capable of damming these rivers and stopping their flow. It is easy to make this counterpoint if we ignore 300+ years of history in the region. Specifically, the British colonial legacy, and the 'games' the British played with legalism. The British, of course, from the 1700s through until the at least 1960, sought to dominate and control much of the world. They had a decades long campaign to erode Qing power and gain control of China. By 1913, the British controlled much of Africa, India, Malaysia, Egypt, the Middle East, Australia, many cities in China, Burma, etc. But what was the legal status of all these places? India, for example, didn't legally become a British colony until 1858. However, the British controlled much of India and its economy since the 1750's. Between 1750 and 1859, the Moguls were legally in charge. Egypt, as another example, was controlled by the British from 1882 until at least 1952 with the rise of Nasser's popular leadership. However, Egypt until 1914 was a province of the Ottoman empire. There were a variety of legal arrangements after 1914. The point is that the British empire often gained and held colonial power without legal colonial status. So Tibet declared its independence from China in 1913. What does this mean? A glance at the map above shows that on the other side of the Himalayas lies India. And, of course, in 1913, India was part of the British Empire. Was Tibet just another British colony? Or an actual independent country? Was Tibet an independent country? Or was it a British colony? Mark Wallace's answer on this page hints about the answer to this question; the true answer, however, it not relevant to the OP's question. What matters here is how Mao and the CCP viewed Tibetan independence. If Tibet was truly independent of European colonial powers, and had a strong army, then invasion would be risky with little gained security. However, Tibet had limited armaments in comparison with the PLA, and British influence was almost certain. Since Tibet was legally part of China anyways, how could Mao not have invaded? Of course, securing control of China and Tibet wasn't enough for Mao and the CCP to feel secure with their power. They had been at war for decades, and still needed to rebuild the Chinese economy and extend its influence to its neighbors. Mao was very concerned about American and British influence in its territories. This nascent CCP regime had many weaknesses in the early 1950s. The Korean war started in 1950, the same year that the CCP extened it control over Tibet. China would intervene in October 1950 to help North Korea fight Americans & other UN forces. What motivated the soldiers in the Chinese Army? They fought against tremendous odds against a wealthy, technologically superior US military. Nearly half a million Chinese soldier were killed, and another half million were wounded. These soldiers were overwhelmingly opposed to any foreign powers controlling China, and opposed to having US military bases right on their border. This was not just an idea that came from the CCP; it was one that was popular throughout China. Those who went to fight against the US in North Korea felt they were protecting themselves and their loved ones against foreign exploitation. In the late 50s, the CIA and the US government sponsored armed insurrection in Tibet. This can be viewed as proof that the CCP needed to preclude Tibet from developing into a British puppet state; the US and the CCP were indeed enemies. Another thought: Why China during the Qing came to control Tibet is another interesting question. The answer is easy: China was plagued for thousands of years with invasions by "Barbarians." Several conquered all of China: the Qin, Tang, Yuan, and Qing dynasties were all 'barbarian' regimes; more than a thousand years. For hundreds of years, the Tibetans were a significant military threat. This is why the Qing maintained strict control over Tibet and Mongolia. [Note 2] The GMD put this number at 1 million, the CCP at 10 million. I have seen figures saying dislocated farmers and irrigation failures during wartime were responsible for a least 20 million fatalities. de-legitimizes the legitimacy of the government. Legitimate governments provide services to all their citizens, not just selected systems. de-legitimizes the claims to control of the territory. effectively invites foreign powers to exercise control or internal regions to rebel. Legitimate government is very important to the Chinese - they have had continuous legitimate government for longer than anyone else. I'd hazard that they've had legitimate government for longer than all of Europe combined. Note: I'm not taking a position - I'm trying to explain the article text. Obviously there are many sides with different viewpoints. the part not occupied by Britain was under the administration of China. During the 19th century, Britain dealt with Tibet through the Chinese government. After 1912, China failed to exercise effective control over the Tibetan Autonomous Region, but still claimed the territory. China never recognized a Tibetan government. Implicitly Britain acknowledges Chinese rule over Tibet. That means that both of the countries involved agreed that Tibet was part of China. So why did China "invade" Tibet? Because Tibet was always part of China. China merely moved to re-assert control and prevent chaos or foreign incursion into Chinese territory. In Milwaukee Wisconsin there is a militia that rejects the authority of the United States. If the Milwaukee police were to show up one day and arrest all the members of the Milwaukee militia and demand that Milwaukee residents receive civic services from the city of Milwaukee and the State of Wisconsin and the United States government, that wouldn't constitute an invasion. It would just be a re-assertion of normal authority. According to the Chinese, this is what is happening in Tibet. I need to finish with the same disclaimer - I'm not taking a position on international relations; I'm not qualified. I'm trying to boil down the Wikipedia page into something a bit more understandable. The short version is that to the minds of a lot of Chinese, that was historically Chinese territory. They were just reclaiming what was theirs. A lot of modern Chinese territorial claims go back to the Manchurian "Qing" dynasty, which ran China from 1644 to 1912. 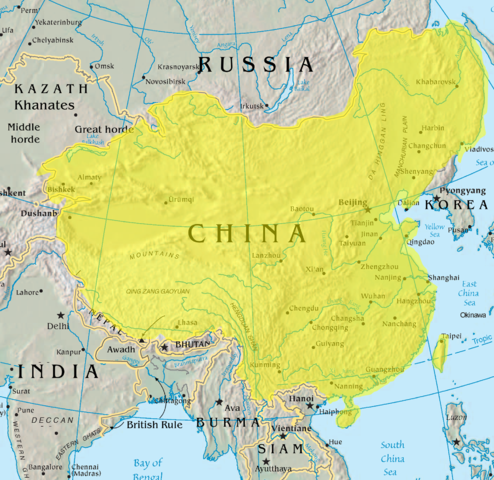 At its greatest extent, the Qing ruled a very expansive territory that included Manchuria, Taiwan, Mongolia, and Tibet. The Manchurians were particularly keen on controlling Tibet as they, like many Altaic peoples, (eg: Mongolians, eastern Turks) were largely Buddhist, and viewed Tibet in much the same way a westerner in the Middle Ages viewed Rome. What cemented you in the Altaic mind as an Emperor was that you were the protector of Buddhist Tibet. After 1912 there was a revolt against the Manchurians in China. This was won by the Chinese (non-Manchurian) side. Both Tibet and Mongolia seceded immediately from the new political unit. This short-lived Republic was fighting a Civil War with the Communists and the Japanese nearly its entire 30-year history. Eventually the Communists won the multi-sided war and became the current Government. So from the Chinese point of view, the Qing dynasty established Chinese rule over that territory, and its period of self-rule after that was illegal. They (the Chinese) sadly were just unable to enforce their rights on the locals in the intervening 40 years. From the Tibetan Nationalist point of view, they were an independent country, that occasionally throughout history had foreign Buddhist Emperors acting as "protectors", the last of which happened to also be ruling China at the time. But that doesn't make them Chinese, and what happened in the 1950's was nothing short of an invasion. An incidental cause would of course be the presence of an independent Tibetan communist party. The extensive solitary suffered by Wangye is indicative of the vehemence with which the CCP opposed an independently communist Tibet. Not the answer you're looking for? Browse other questions tagged 20th-century china colonization invasion tibet or ask your own question. When has serious unemployment among educated young populations not led to revolution or war?